Telltale Games' Poker Night 2 will be released late April on the PlayStation Network, PC and the Xbox LIVE Marketplace; other systems to be announced. 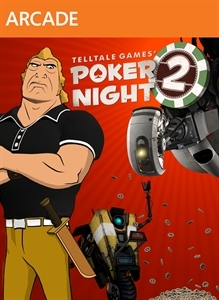 Poker Night 2 is rated 'M' (Mature) for Violence, Suggestive Themes, Strong Language, Simulated Gambling, and Use of Tobacco by the ESRB. Telltale's Tales of Monkey Island brings the adventures of pirate Guybrush Threepwood into a new era with an explosive storyline that becomes deeper and more entangled during the course of the five-episode saga. While battling his nemesis, the evil pirate LeChuck, Guybrush accidentally unleashes an insidious voodoo pox that threatens to transform t..
On the stormy night when Jurassic Park fell apart, a desperate smuggler infiltrates Isla Nublar, hunting the precious canister containing the contraband dinosaur embryos. She collides -- literally -- with park staff trying to evacuate, and they become stranded amidst the collapsing park ruins, with the newly-freed dinosaurs on the loose. When InGen.. Episode one of a five-part game series set in the same universe as Robert Kirkman’s award-winning series. Play as Lee Everett, a convicted criminal, who has been given a second chance at life in a world devastated by the undead. Experience events, meet people and visit locations that foreshadow the story of Deputy Sheriff Rick Grimes. A tailored ga.. Episode two of a five-part series set in Robert Kirkman's award-winning universe. Three months after the events of episode one, starvation forces the group to seek food from strangers. In a world where the living can be more dangerous than the undead, this is a risky move, but you’ll soon learn how far you'll go to survive. How will the choices you..